I love being out in nature with my camera and share my photographs of wildlife and conservation lands with the Harwich Conservation Trust for newsletters, slideshows and brochures. I also attend events that they sponsor such as the wolf and owl presentations and provide them with those photographs as well. I was a Trustee of the Harwich Conservation Trust for a number of years and it is natural to think of them and help them in any way I can. I organized an evening of dining and entertainment, called “A River Runs Through It” at the former Country Inn, years ago to raise money for land along the Save Monomoy River Campaign. And got involved in creating the signage you see today on all the Trust properties. I covered the wolf presentation for the second time for The Cape Codder and asked to meet the wolves before the program. They were inside the Wolf mobile, a large converted Marine Corps bus. When I stepped aboard, they started leaping in the air with excitement. The handler took my camera away and told me to sit down immediately when I went inside the bus. I was told to look the wolves in the eyes and never look down or away. I almost declined. I hadn’t dreamed I would be near five wolves and a skinny guy with a camera in his hand and no weapons. I took a deep breath. It was surreal being so close to these majestic animals. Somehow, I must have smelled like wolf when I went home. My cat wouldn’t come near me. But it was worth it. A thrill. And a victory. I got my portrait of the wolf matriarch, Magpie, which hangs in the Trust office. Harwich is a town with a lot of heart. It’s a working person’s town. I travel and the Herring River is one of the most beautiful sights anywhere. I have been doing more art photography and am represented by Addison Art Gallery in Orleans. I’ve had two solo exhibits at the Cape Cod Museum of Art. 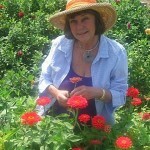 I’m also a master gardener and wrote a gardening column for The Cape Cod Times until I started working on a book of photographs called Farms of Cape Cod. I grow flowers and bring them to the Orleans Farmers Market And I still write for the newspapers when I have time. My book was published this summer so I have been giving talks and doing radio and television shows, and signing books. I was a Trustee of The Sampson Fund for years along with the Chase Library. When I belonged to the Garden Club of Harwich I created the Sarah Woodland Wildflower Meadow at Thompson’s Field with the help of the club and the community. Everyone turned out to help. We cleared a parking lot, put up fencing and planted gardens. We marked both entrances to Thompson’s field with signs when most people had no idea that we had a 57-acre field there.